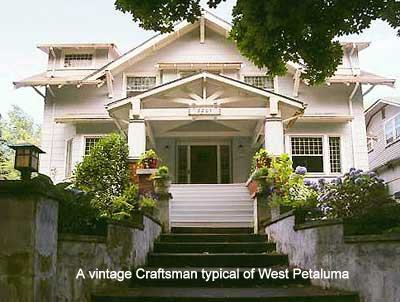 West Petaluma is home to a number of beautifully preserved and restored craftsman homes with wood, shingle, and stucco siding. 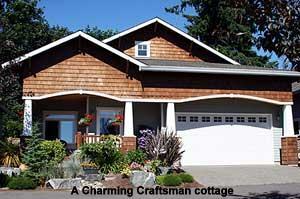 Additionally, many of Petaluma’s newer executive home developments have chosen the craftsman style. 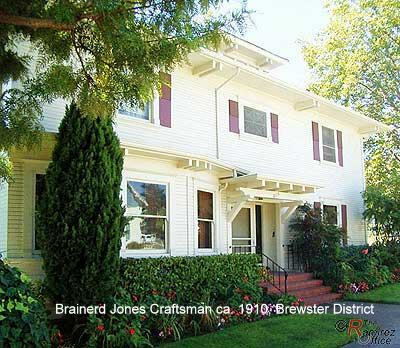 The Brewster district holds many of these period homes, which range from modest 1000 sq.ft. cottages to open and spacious +2600 sq.ft. estates. 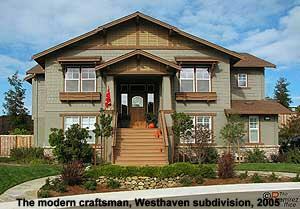 West Haven and Southgate are two of the most recent developments to showcase the modern Craftsman home. “The bungalow was the dominant style for smaller houses built throughout the country during the period from about 1905 until the early 1920s. The Craftsman, the most popular style of bungalow, originated in Southern California and quickly spread-via pattern books and popular magazines-throughout the rest of the country. Anyone, anywhere, as long as they lived near a train depot, could pick a bungalow style out of a Sears Roebuck or Aladdin Redi-Cut catalog and have the whole house-plumbing and all-shipped to them. The roots of the American bungalow are found in the Indian province of Bengal. Eighteenth-century one-story huts with thatched roofs were adapted by the British, who used them as houses for colonial administrators. In the 19th century, the "bangla" or bungalow's economy of space, simplicity of form, and closeness to nature inspired the English architects for the Arts and Crafts (Craftsman) movement.